These are hands down, my favorite recipe on my site! Deep dark chocolate brownies with a delicious Oreo truffle layer, topped with a soft layer of chocolate. If you want a crowd pleasing recipe, these are for you! Preheat oven to 325°. Line a 9x9 baking pan with parchment paper, set aside. Pour the batter into your prepared baking pan and smooth it out until level. Bake for 22-25 minutes or until a toothpick comes out slightly moist with a little bit of batter left on it - the top will not look so "wet" anymore when they are done. This is what makes them fudgy. Let them cool completely in the pan. While the brownies are cooling, prepare the truffle layer. In a large food processor, add Oreo cookies and pulse into a fine crumb. Dump in cream cheese and pulse until a "dough" like consistency forms and you can't see the cream cheese anymore - it will form a large ball when it's ready. Once brownies are completely cool, take chunks of the truffle mixture and pack it onto the brownie in an even layer. In a small bowl, melt the chocolate chips and shortening at 30 second increments in the microwave until completely smooth and pourable. Pour the chocolate on top of the truffle layer and spread it out with a rubber spatula into a smooth and even layer. Place tray back into the refrigerator for 20 minutes to allow the top to set up properly. Take the pan out, allow the brownies to come back to room temperature for at least 10 minutes for smoother cutting lines. 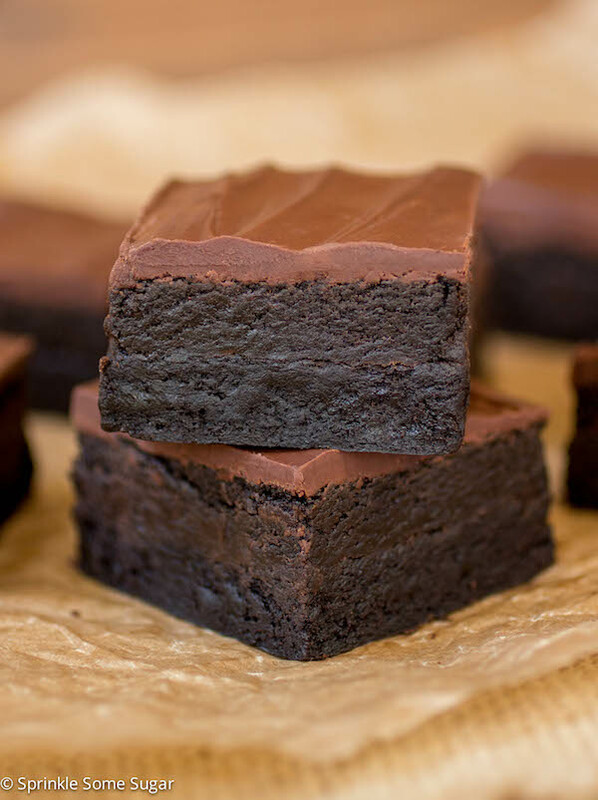 Triple Dark Chocolate Truffle Brownies will stay fresh for up to 5 days stored in an airtight container. 0 Response to "TRIPLE DARK CHOCOLATE TRUFFLE BROWNIES"